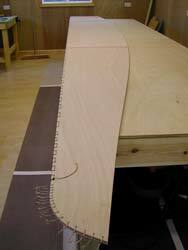 Before I can assemble the panels I need a simple cradle to support the panels during stitching and help keep everything level and true. The figure to the right shows the series of frames I've cut from 9mm ply. 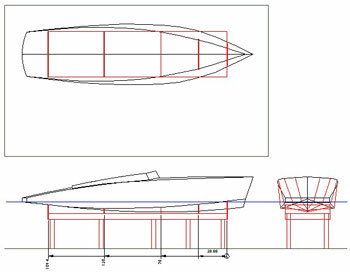 The next figure shows the position of the support frames on the bench and the position of the boat within the workshop. It's at this point you wished you'd built a bigger shed. 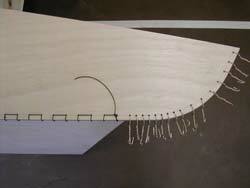 The two bottom panels are stitched together using fishing line except for the stem area. Here I've used 16swg wire because the strain in this area is very high and the clamping force can be easily adjusted. 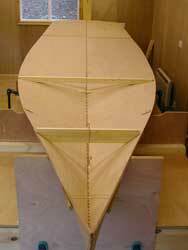 This was the second attempt at panel stitching, after the first I modified the keel line profile as shown. 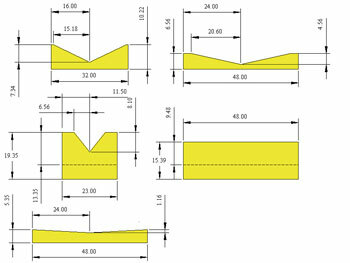 The original shape must be a quirk of the panel development software, I always wondered how it could possibly work. 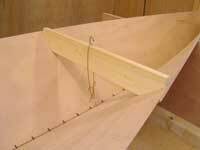 Now the panels are opened out onto the jigging frames. 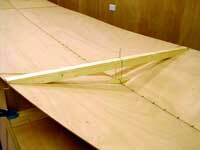 As you can see I've tried a variety of ways to force the panels to the correct profile, from spreader beams to screwing through to the support frames. The later is definitely the most effective. 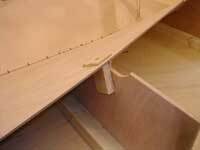 Then the chine edges are planed to the correct angle of the side panel.